An international collaboration of researchers, including from the School of Life Sciences at the University of Warwick, have sequenced the genome of the milkweed bug, enabling scientists to understand at the molecular level what makes the bug, from its colourful development to its toxic diet. The Hemiptera are a diverse insect order, with a similar number of species to the flies, wasps, and butterflies. This includes sap-sucking aphids, blood-sucking bed bugs, and seed feeders like the milkweed bug (Oncopeltus fasciatus). However, so far very few Hemiptera have sequenced genomes, a critical DNA resource for understanding the genes and proteins behind a species' biology. A major boost for insect biodiversity and for the Hemiptera has come from the i5K Project. This large, international consortium seeks to sequence 5000 genomes of insects and their relatives. Within this framework, the milkweed bug genome was sequenced and analysed by 83 researchers working in 27 teams across 10 countries. They report their large-scale comparative results on the Hemiptera in a new paper published in the journal Genome Biology. "Milkweed bugs are a great species to study," explains lead investigator and species coordinator Kristen Panfilio from the University of Warwick, UK, and University of Cologne, Germany. "They have served as a research model for ecology, metabolism, development, and genetics since the mid-twentieth century, in part because they are very easy to keep. In fact, the strain we sequenced for the genome project is also used in school classrooms, as the bugs are a beautiful red-orange and black colour throughout their life cycles." Now, the genome data allow researchers to directly link genes with diet and, ultimately, bugs' wing and body colours. One key output was to create a database of all enzymes involved in metabolism in the milkweed bug, supporting comparisons across species. 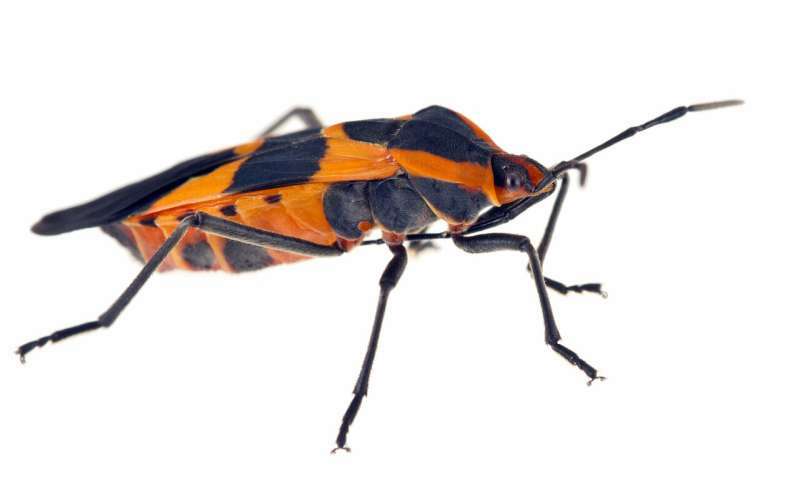 The striking red-orange colour of the milkweed bug is in fact a warning sign to potential predators: milkweed is a toxic food source, and bright warning colours announce that the bugs would taste bad. This is the same coloration seen in monarch butterflies, which share this food source. However, metabolism comparisons now reveal that the bugs and butterflies have different enzymes for handling essential amino acids (the building blocks of proteins), despite their shared diet. Some of these amino acids are required for the insect to make its wings. The wings are the result of development for precise structure as well as colour. The new genome information allowed researchers to experimentally test subtle variants (isoforms) of a key regulator gene for wing development, using a technique known as RNA interference (RNAi). "Having worked on wing development for over fifteen years, it is exciting that we now have access to the genome to fully analyze some of these very complex genes," elaborates co-author Deniz Erezyilmaz, who conducted the RNAi experiments for the paper at Stony Brook University, USA, and is now based at the University of Oxford, UK. The new study also finds that species with highly specialised liquid diets, like aphids and bed bugs, tend to lose not only certain metabolic enzymes, but even the breadth of their smell and taste receptors. In contrast, the milkweed bug, which preferentially seeks out and feeds on milkweed plants over a broad geographic range, retains a much fuller repertoire of sensory proteins. 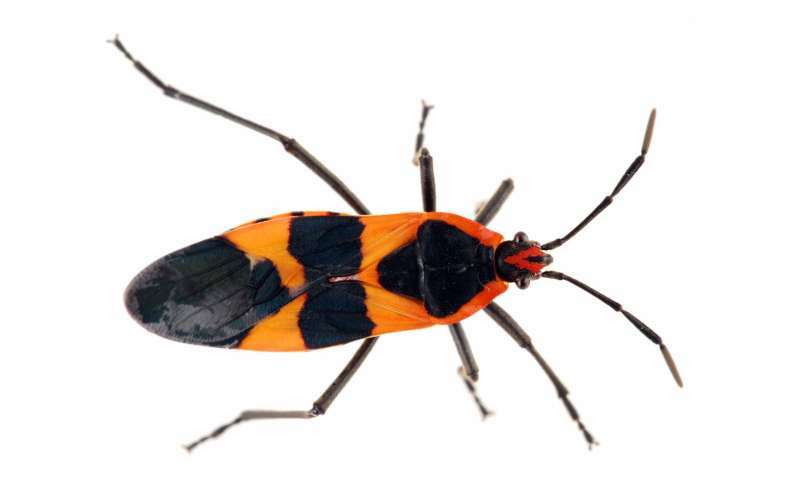 At the same time, milkweed bugs and some of their close relatives have newly acquired genes from bacteria, integrating the genes directly into the bug genome. 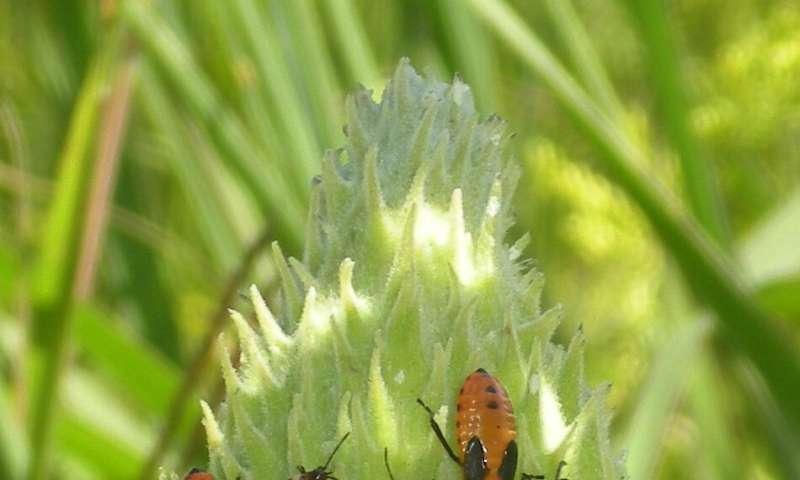 Some of the new genes provide enzymes that help these plant feeders digest the plant tissues' tough cellulose, including in the stink bug, an invasive pest species. Knowing which genes support an invasive species' diet can aid researchers in developing strategies for integrated pest management. Finally, the study highlights molecular features in bug genomes. Fruit flies and wasps have very small, compact genomes, while bug genomes are often over five times larger. So even though bugs and flies tend to have the same number of genes, their structure differs, with bug genes being widely spaced out along the DNA. One feature identified in this study is that bug genes tend to be made of many more, small units than fly genes, due to a phenomenon known as episodic intron gain and turnover. Co-author Robert Waterhouse, at the University of Lausanne, Switzerland, explains, "As genome sequencing projects continue to venture out into the wider array of insect and animal diversity, knowledge of gene properties in larger genomes will be increasingly important." i5K pilot coordinator Stephen Richards comments, "Many insect species are agricultural pests or carry diseases, and genome sequencing can help scientists figure out how to combat this. However, the DNA sequence of the genome isn't enough. I congratulate Dr. Panfilio and the international milkweed bug community on this outstanding achievement, which has already accelerated research on bugs. Comparing the milkweed bug with other species like the bed bug is critical to understand the unique value of each species." Researchers will continue to investigate genes important for feeding ecology and linked biological features in bugs. This includes the molecular basis for the red warning pigment as well as bug-specific proteins involved in chemical protection and development.